Trailhead and parking area are on Starr King Road in Jefferson, NH (summit is in Kilkenny). Starr King Road begins on the north side of Rt. 2, 0.2 miles southeast of Rt. 115A. The parking area is 0.3 miles up the road. Mt. Waumbek is the highpoint of the Pliny Range. Poking barely over 4000 feet in elevation, it is often considered a "viewless" 4000-footer. 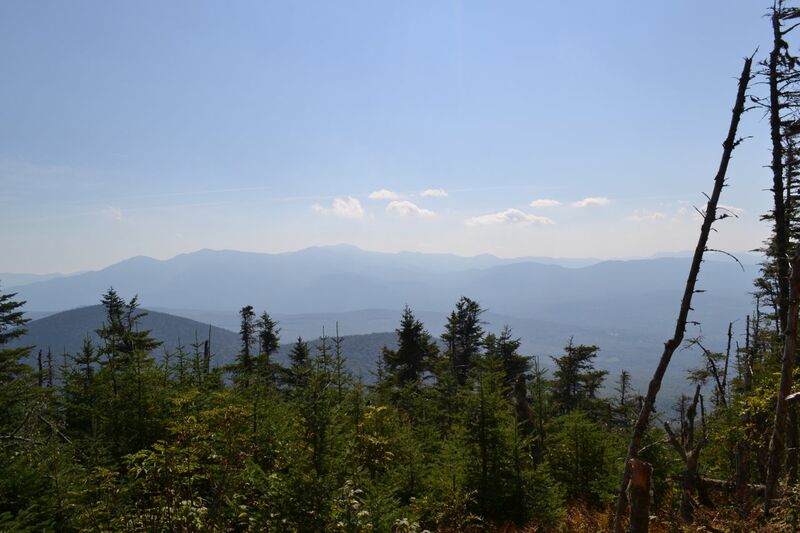 Many hikers make the mistake of turning around at the summit cairn, but by continuing just yards over the summit, you can enjoy a good view of the Presidential Range from a blowdown patch. On the way, the trail climbs over Mt. Starr King, which has long been popular for its view of the same range. However, the gradual growing in of Starr King's viewpoint and the appearance of the blowdown patch on Mt. Waumbek has made Waumbek's view more beautiful than its once famous neighbor. The Starr King Trail leaves the parking area and heads into the forest, turning a few times before taking a straight course, following an old logging road. It ascends gradually and soon passes two circular stone foundations connected with pipes, the remains of an old water system. After a while, the trail turns to the right, then back the other way and becomes steeper, following a ridge top. It remains in an open, bright hardwood forest for just under a mile of climbing. Then, it leaves the ridge top and angles across the west side of the ridge. The trail soon passes through a very abrupt transition from hardwood to evergreen forest and becomes very rocky. It remains on the side of the ridge for another mile; then the trail turns right and heads straight for Mt. Starr King. After passing over the summit (reached at 2.6 miles from the parking area), the trail enters the view clearing. The views are best seen from the rock shelf at the back of the clearing. By moving around, the entirety of the Presidential Range can be seen. On the left side of the clearing is a stone fireplace and chimney from a former shelter; the trail continues back into the woods near this. The Starr King Trail follows the ridge to Mt. Waumbek. It descends gently, then drops slightly off the ridge to the south side. It is winding and flat for a while before making a moderate ascent to the summit, exactly one mile from Mt. Starr King. Pass the large summit cairn and continue straight onto Kilkenny Ridge Trail, then descend a short distance to the small blowdown patch, where there is a good directional view. The perspective of the Presidential Range is nearly the same as it was from Starr King, but this better viewpoint also shows much to both sides of the range. To the left side, you can see the Carter-Moriah Range. To the right of the range, you can see Mt. Dartmouth and Mt. Deception, with the Willey Range and Mt. Carrigain above.